George Nugee, pictured at his wedding in 1927. George Nugee, after his retirement from the army. The information in these brief biographies of the Nugee family has been assembled from genealogical sources greatly augmented by family archive information generously made available by Mr Julian Walker, which includes the private memoir of, Andrew Nugee, short extracts of which are quoted here where appropriate. Andrew Nugee was the youngest of the three sons of Revered Francis Edward Nugee, Rector of Muston 1903-1913, and his wife Edith Isabel (née Alston). Their children were: Elizabeth Catherine (born 1889), Laura Christine (b.1890), Francis John (b.1891), George Travers (b.1893) and Andrew Charles (b.1895). We are greatly indebted to Mr Walker and hope this short account, and those of the other two sons, John and Andrew, capture the spirit of service and sacrifice of this remarkable family. George Nugee was the second of the three sons of The Reverend Francis and Edith Nugee. Each of the boys served in the army during the First World War. They also had two sisters, both of whom took part in the war effort, one as a VAD, the other as an organiser of the Land Army. George was a long-serving professional soldier who fought with distinction in two World Wars. 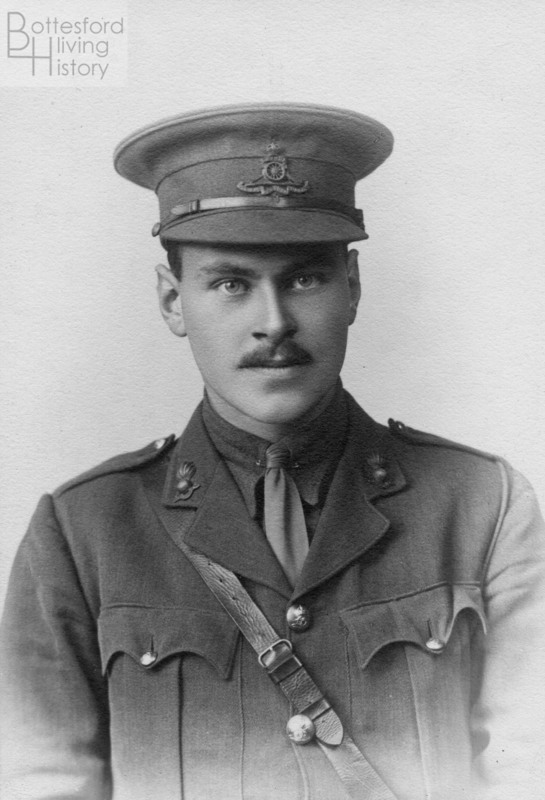 He entered the Royal Artillery from school in the winter of 1911-12, and then served with the artillery until 1947. His first command was of a battery of the BEF in 1914, and on the same ground he successfully led his men back to Britain during the evacuation of Dunkerque in 1940 before going on to play a major role in the defence of Gibraltar. He was awarded the MC, DSO and CBE. George Nugee was born on the 7th July, 1893, at Sneinton, where his father was vicar. The family moved to the vicarage at Shelton, near Newark, and then to the vicarage at Croxton Kerrial, before taking up residence in the Rectory at Muston. In 1902, while his father was vicar of Croxton, George was sent to Laleham Preparatory School, following in the footsteps of his brother Francis John, then in 1906, again following his older brother, he became a pupil at Radley College, Oxfordshire. At Radley, George, who was destined for the Royal Artillery, was in the Army class, and did well. He had got into the 2nd XI at football, gaining his 1st football colours in 1910. He also joined the 2nd rowing VIII, and then went on to the 1st VIII in 1911, when he rowed at Henley in the Ladies’ Plate. He was made Senior Prefect in the winter of 1911, but left Radley in January 1912 when, aged 19, he was accepted into Royal Military Academy, Woolwich, the army’s academy for the training of commissioned officers of the Royal Artillery and Royal Engineers. Here he advanced many places in the examination lists, passing out far higher up than his position at entering. He was second in the championship ride for the Saddle. He was appointed under-officer of his company, which was champion company at the passing-out parade in the summer of 1913. When he was gazetted for the Second Lieutenancy in the Royal Field Artillery, it seemed likely that a distinguished military career lay in front of him. At home in Muston, George had his own double-barrelled twelve bore shotgun. He fished in the Devon ponds by Woolsthorpe, and tried his hand at fly fishing in the Witham near Grantham, flogging the stream for hours on bitterly cold days. The Nugee boys were encouraged to ride, and there was plenty of hunting to test their budding skills. Their father hired a groom from a livery stable in Grantham to come over and give lessons. George became an expert horseman, as his later career at RMA Woolwich and the Royal Artillery was to show. Family diaries record his going to meets with the groom even before he went to Radley, and he was allowed to keep his pony at home through most of the Christmas holidays. George Nugee joined the 88 Battery, 14th Brigade RFA, at Deepcut in time to take part in Army manoeuvres in the autumn of 1912. Then the brigade moved to Colchester, the HQ of the 4th Division, with which formation it was destined to go overseas in August 1914. In January, 1914, George took command of reservists who were reporting there, and took them over to France as reinforcements at the artillery base at Le Havre at the start of the war. As the German advance progressed, the base was moved to St Nazaire. In September, 1914, he went to the forward areas of the Small Arms Ammunition column of the 4th Division, and in October returned to his brigade, rejoining the 88 Battery, with which he was to remain till he returned to England in September, 1918. The 14th Brigade, RFA, was a unit of Britain’s pre-war regular army. It comprised 39, 68 and 88 Batteries, under command of the 4th Division. This Division, initially planned to be part of the original British Expeditionary Force, had at the last minute been held back in England to counter any German landing. A decision was soon taken to despatch it to France and it arrived just in time to play a valuable part at Le Cateau, where it fought without many of its component units, which were still en route from England. The 4th Division then remained on the Western Front throughout the war. It took part in most of the major actions, including the Second Battle of Ypres in 1915, the Battles of the Somme in 1916, many phases of the Battles of Arras and Ypres in 1917, and the major actions in 1918. George was home on leave in January, 1915. The excitement was his sister Laura’s engagement. The date for the marriage was to be the 7th August, but a War Office telegram arrived stating that his younger brother Andrew was severely wounded in hospital at Le Touquet, after which he accompanied his mother to visit Andrew in France. He then remained with the 88 Battery till he was sent home in September 1918, and was in England at the Armistice. During those four years he was only away from his battery for two periods, apart from leave. In April 1915, he developed German measles and spent several weeks in an isolation hospital near Boulogne. The second occasion was in March, 1918, when after a few days away he was ordered back to his battery, with the temporary rank of major, and led them through the grim retreat before the advancing Germans and into the first weeks of the subsequent advance of the armies to ultimate victory. George Nugee experienced one of the early gas attacks in May 1915. He was forward observing officer and, in spite of the meagre protection afforded by the inadequate gas mask then issued to the troops, held to his post throughout the day and observed and directed the fire of the guns in his sector to such good effect that the enemy infantry were unable to come to the attack. For this he was given the Military Cross in the 1916 New Year’s Honours. Later, for his outstanding services during the German advance in 1918, he was awarded the DSO. In 1919, His family were able to be at the Palace to see both brothers, George and John, receive their decorations from His Majesty himself. George could carry the DSO, MC, 1914-Star (the Mons Star) and the other two war medals; and as he was three times mentioned in dispatches, he had the palm leaf on the ribbon of the war medal. In 1919, soon after the end of hostilities, he went to India to take command of a territorial battery at Fort Parachinar on the North-West Frontier, where there was fighting with the Afghans. He became adjutant of an RHA brigade, and went with them from India to Egypt and then back home, to a posting at Newport, Monmouthshire. He became engaged to his cousin, Mary Richards, daughter of Colonel Harold Richards, RASC. Their marriage in 1927 at Godalming was described as “a very noteworthy affair”. George wore the full dress of the RHA. Brother officers formed a guard of honour and manned the carriage in which the couple left the church. When WW2 was approaching, George took his battery from their base at Lichfield to their war station, the defence of Glasgow. Preparations were by no means complete. The reserves had not been called up, so there was not a full complement. One of the batteries at Lichfield had no guns at all. Of his guns, he could only aim two of them, as the range and height finders for the other two pairs (predictors) were defective. He was promoted lieutenant-colonel early in 1939, and given command of one of the new Militia training regiments for A-Artillery near to Sherborne, where they moved in the summer of 1939. In 1940, he was lieutenant-colonel in command of the 75th Field Regiment RA in France, where he had been since before Christmas, 1939. His regiment, with what was left of an infantry, had been detached from the 51st Division and sent to form a defensive line at Le Havre. From there they withdrew to Cherbourg, where he was able to get all his men, with very few casualties, and even some of his guns, onto a ship; and they got safely back to Southampton. In September 1940, he was appointed CRA in Gibraltar with the rank of brigadier, an important post especially when it seemed probable that the Rock would be under siege. He went out early in October and undertook the equipping of the Rock as a modern fortress ready for any attack. He returned from Gibraltar in 1944, and became CRA of Eastern Command at Luton Hoo, then with the rank of full colonel took command of RA Records at Rugby. He retired in 1947, after a distinguished career of thirty-four years, with CBE, DSO and MC to his name, and four Mentions in Dispatches to his credit. In 1944, his children and family returned to their old home at St Margaret’s on Thames, and there George settled down. He later moved to Heathfield, Surrey, and later still to Terterden, in 1963. Colonel (Honorary Brigadier) G.T. Nugee, CBE DSO MC, died on the 29th March, 1977, at Wallingford, Berkshire, aged 83.